Hey, wow, it's been a long time. By crazy, of course I mean my every day ordinary life. So it's nothing to get worried about. I guess we never take time enough to just sit down on the computer. Ok that's a lie. We never sit down long enough to mentally prepare ourselves to write a blog. That's better. What is it about writing blogs that scares this family so much? I don't know but all I do know is that it takes a lot of time. And time is precious. Because we only have 24 hours in a day. And only seven days a week. Did you know there are only 52 weeks in a year? Yeah. And it's November already. Yeesh. I'm really grateful for this woman of the Lord. She has impacted me greatly, guided me from what guidance she can give me from the Holy Spirit, and prayed over me through some rough areas of my life. Yeah- betcha didn't know that an MK's life is hard, huh? Well, it is. But thankfully God enables us to be able to step back for a little bit and view our life in a different perspective. Then we can see the big picture and know everything is not just what it seems, and everything is worth the cost- if the prize is Jesus Christ. I was just reading a little figurative comparison of our life to an embroidered cloth, that came from Corrie Ten Boom. She was saying something like, 'we almost always view our life from the side of the cloth that has all the knots and tangles in it, but the picture is so much more beautiful if we view it from the embroidered side, where the colorful picture comes to life.' Yes, in this life we can see the colors, we know that God is "stitching" all things together for His Glory, but unless we come to the realization that there's another perspective to be seen, we might never fully appreciate our life for what it is. Anyway. These times with Hannah seem to strengthen me a little bit each time I go. It's good to talk to people and open up, because then you're not pressing everything inside that was meant to be shared. Thanks Mom and Dad for being there for me too. If anyone has a burden to pray- you can pray for strength, peace and rest for me. I'm still adjusting to this new time in my life where I'm now sharing my home with five boys- four 'adopted' and one biological. It's still a great leap for me, and I'm now struggling with sharing my family which I hadn't been at the beginning of the year- and also trying to find some peace and rest in this now chaotic life of mine. Some have gotten used to surgeries happening regularly in their household but not me. A few weeks ago we had two of our boys in surgery in the same week. One was planned. The other was a surprise. They added to a very busy and emotionally intense season of our lives. In the middle of the week of surgeries I was feeling stress that I knew, as I looked ahead on the calendar, would not soon be over but rather heightened. God revealed that He was doing surgery on me: cutting out some of the supports I had leaned on rather than on Him. Like one of the surgeries, He was cutting out the excess in my life that I didn't need (according to Him) because that excess was putting pressure on nerves that brought pain and eventually could bring death to parts of me. He showed me that though I should make a time of solitude, prayer and quiet reflection, Bible reading and meditation a regular and necessary habit of my life, it was my every day life that should be living these things. Can I call on my Heavenly Father to pick me up and hold me in times when "people" become too many and too much? Can I make prayer a habitual breathing throughout my day? Can I contemplate the actions and interactions I live throughout the day presenting all of them to God, my Father, for His perspective? Can I use memorization of God's Word as a way to carry His Word in my heart, ruminating on His Word throughout the day till it becomes part of me. The biggest question I had in my heart and mind was whether I could rest even in a season like this. As I searched Scripture, the Bible told me I could. It seemed clear to me from Hebrews that rest had to do with obedience and it was very closely tied to Sabbath. Stress was there, lack of sleep and anxiety were also there, but rest came from unexpected places and even, at times, from places that I didn't like. God's grace is amazing. In the midst of all the chaos of the season, at the height of the New Hope Uganda homecoming, elders and management were asked to come forward in the Sunday morning (afternoon by this time) worship service. People were invited to come forward if they wished to be blessed by their leaders. The estimate of people that we asked God to bless one by one was somewhere over 400. For about 4 hours we stood and blessed and I experienced Sabbath rest in the midst of the constant flow of people. Bestowing God's blessing on children, staff and community people was one of the greatest blessings of my life. Joy was revealed as I looked in the eyes of those who came and saw a glimpse of the way Jesus sees them. The Great Physician had completed one of His many surgeries on me. Ahhh.... Riding a dirt bike for the first time... awesome!! It was at the Kelley's, in Clay Center, Kansas, and when they offered, I was both excited and nervous. John Kelley, the Dad, showed me how to operate it, and when he finished, I was off!....slowly. I went slow at first because I didn't know what could happen, and if there was big bumps in the area that we were riding, but of course there was nothing to fear. Us getting ready to ride! So with the sound of engines in my ears, and the rough handles vibrating in my grasp, I went faster and faster, until I was at full speed, which wasn't very fast, cause I was on a little bike. If I didn't go fast enough, I could catch a faint hint of gas. I rushed around, everything a blur around me, other riders on bigger bikes zooming ahead, racing to see who was the fastest. Obviously not me. What an exhilarating feeling! Near the Kelley's house was a valley filled with bushes, and many paths among them. In many places there were jumps going out of the valley, and if I went fast enough, I would get both wheels in the air, which was awesome. Weaving in and out, we would try to find new paths, with some ending in dead ends. In and out, down and up, stopping and going, around and around we went, never getting tired of it. Because, of course, it is awesome! I love that memory, and can't wait ride dirt bikes again. We had fun, my Dad, Kara, and I, riding dirt bikes for the first time. 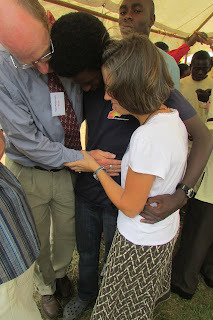 We miss those in Clay Center, as we miss those in Colorado Springs, Tulsa, and many other places, especially those in Uganda, as we did not expect to say goodbye so soon. We miss, and will miss, everybody. Thank you all! Yes, we are heading into our last month and a half. The majority of the traveling is over. Besides driving down to Seaside, Oregon of course. Relaxation, for the most part, the rest of the month, and most of next month. November 2nd, Friday, we went up to the place where my Dad grew up, Mt Vernon. After some school, of course. We looked around for most of the day, then went to a concert that near there. Saturday and Sunday we hung around and Sunday we went to church. Monday we did school and then we met a friend that we met in Uganda up near Seattle. Tuesday the 6th we did school, went over to my Grandparent's house for a while. Wednesday and Thursday we did school, and on Thursday night we had dinner with an old friend of my Grandparents. Friday we did school and hung out, and Saturday we got ready for our journey. Sunday we started, pretty early, and drove all the way to Port Angeles with my Grandparents. We stayed the night there, then, on Monday the 12th took a ferry over to Vancouver Island, Canada! We stayed there through Tuesday, then on Wednesday we headed back to Port Angeles, then home. Thursday, Friday, and Saturday we just hung out, did school, etc. Sunday we celebrated Thanksgiving early for certain reasons. Yesterday, Monday the 19th, we went to Ikea for breakfast, then did some shopping, then we came home and did our school. Today, this is the last thing I have left. After I finish this, Kara and I will watch some Phineas and Ferb episodes. Thank you all for you prayers and support. We all appreciate it. Please pray for my eye, it has the same problem my other one had in Kansas. We are doing well besides that. Please pray for our final trips. Thanks again! So we are now in Des Moines, which is just south of Seattle in Washington (Washington State, not Washington DC). Or, more exact, Auburn, which is right by Seattle. We have had quite a travel, from Colorado, to Southern California, to here. I haven't written a Blog for a while, so I'll bring you up to date. On Thursday the 4th, three days after my last blog, my Mom's parents came to visit us one last time. They stay through the 6th, then the next day, Sunday, the 7th, they left early. The next two days we hung out and did school. Then Wednesday the 10th we went and picked up my Dad's parents at the airport. Then that night we went to my Grandpa's sister's house. We spent that night, and the next, and the next, and the next there. On Sunday the 14th, we headed out to Durango, Colorado. We stayed at a big lodge just outside of Durango. The next day we headed out towards Flagstaff, Arizona. On our way there, we stopped at Four Corners. The monument was not like I thought it would be. Then the next day, the 16th, we started on our way to the GRAND CANYON!!! It was HUGE! Anyways, after that, we continued on our way to Kingman, AZ. Then, on Wednesday the 17th we finally got to Costa Mesa, California. We stayed there for three nights. The next day, Thursday the 18th, we went and saw the collage that both my Mom and Dad went to, and where they met. Then in the afternoon, we went to Newport beach, and went swimming for a while. It was hard, though, cause the current was strong, and the current was going diagonal. Towards the beach, and to the right a lot. Then the next day we went to a place we have wanted to go to for a long time... DISNEYLAND!!! Some of the rides were fun, but it was still disappointing, because we spent four of our eight hours there in line. I think my favorite part was Space Mountain. They just redid it a year ago, so it might be better now. The next day we headed towards Coarsegold, CA, where my Dad's younger sister lived. We stayed there for two nights. 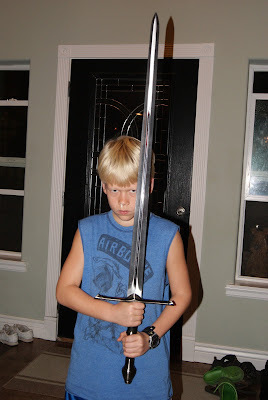 I guess I should mention that my Aunt's Husband has replicas of some of the swords from Lord of the Rings! They were the same length, width, weight, and so on. The first picture is of me with Aragorn's best sword, Anduril, Flame of the west. The other one is the Grand Canyon. Anyways, on Monday the 22nd we headed up to Stockton, and visited most of my relatives that were living around there. Then Tuesday we went to a family's house, that was close to Jacksonville, Oregon, that used to live in Uganda, the Zimmerman's, and stayed there for the night. Then the next day, Wednesday the 24th, we had our longest day of travel. We went from about Jacksonville all the way to Des Moines. The next four days we hung out at my Grandparents house and didn't do much besides going to church and that kind of thing. Then on Monday we went to a free breakfast at Ikea. After that we moved into the house that we are in now. Tuesday we did school in the morning then in the afternoon we went to a clothing bank, then after we went and got our new computer. Now we have two computers for as long as the one that I'm typing on right now. Wednesday, as everybody knows, it was Halloween. We still did school, and then we had lunch at my Grandparents' friends' house for lunch. Then after that we went and saw the movie Hotel Transylvania! Then we went back to my Grandparents' house to hang out for Halloween night. We handed out candy to the Trick or Treaters, and Kara and I snuck around outside watching the people that were walking around. It was fun. Now we come to today. Today we, of course, did our school, and after this, Kara and I are going to watch Phineas and Ferb for a little bit. Thank you all for your provision and support. We appreciate it very much. 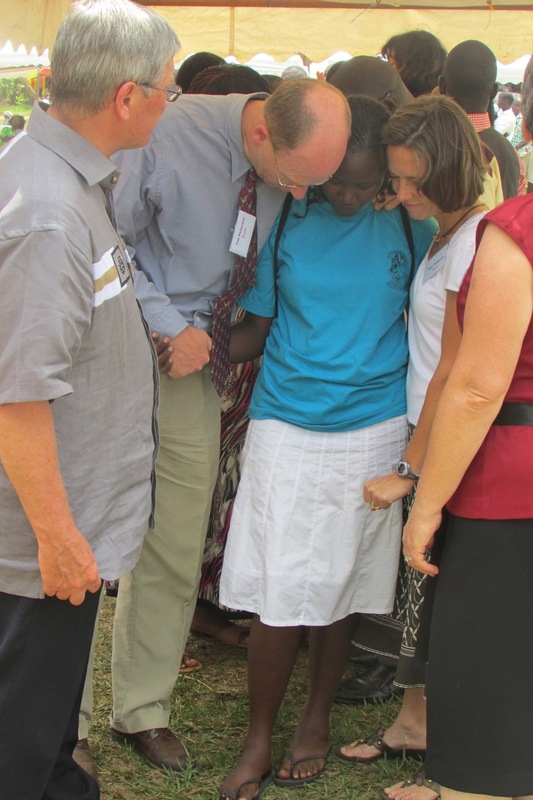 We are coming to the end of our Furlough, and will soon be going back to Uganda. January 1st is when we fly out. Please pray for the rest of our days, and that our flight would go well. Thanks again!